Bayswater residents, councillors and members of parliament want the EPA to assess a proposed concrete batching plant. The EPA refused to assess environmental impacts of the plant, first put forward by WA Limestone in 2011, and gave residents 14 days to appeal, a window that closed on Monday. A letter from the EPA stated the proposal raised “a number of environmental issues” but the overall environmental impact of the proposal was “not so significant as to require assessment by the EPA”. The Collier Road application was frozen in a second round of State Administrative Tribunal mediation with City of Bayswater, awaiting the EPA’s decision. 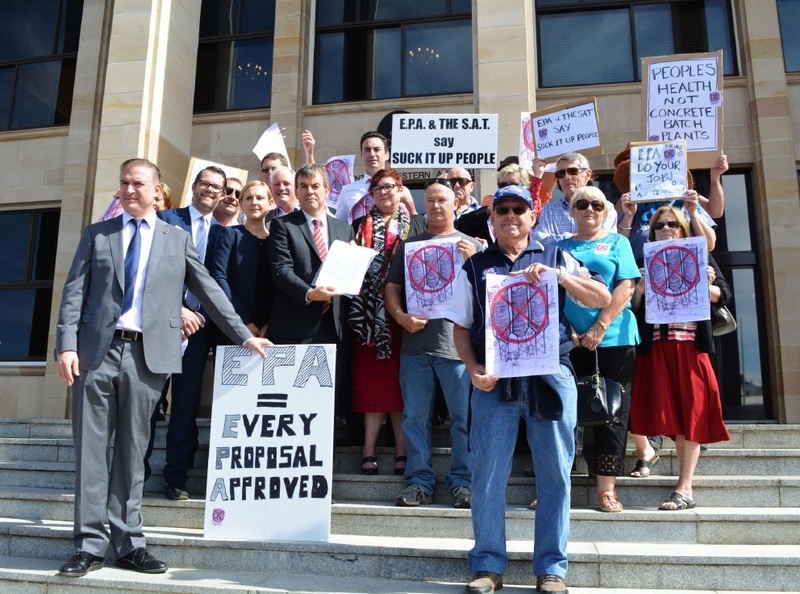 Mayor Barry McKenna, councillors Sally Palmer, Dan Bull and Chris Cornish, Opposition Leader Mark McGowan and a host of Labor MPs joined residents to push Environment Minister Albert Jacob to instruct the EPA to conduct the review. In parliament, Mr Jacob said the matter was currently being investigated by the appeals convenor and he would make an “impartial” decision once he received a report. Bassendean MLA Dave Kelly said local businesses and residents were concerned by the EPA’s decision. “The EPA’s own documentation says for a batching plant there should be a buffer zone of 300m-500m. If they approve this application, there will effectively be zero buffer zone between the plant and the Joan Rycroft Reserve,” he said. Cr McKenna said he was concerned about the lack of buffer zone, dust issues and the amenity for ratepayers if the plant went ahead. “We need the EPA to do one thing: an environmental assessment. The EPA is not doing its job,” he said. Mr McGowan said residents wanted an assessment, which was not “too much to ask for”. Bayswater resident and health practitioner Jacquie Kelly said she was opposed to the development because it affected air quality. “We need an EPA that looks after air quality and doesn’t allow noxious industries like this to come into suburbia,” she said. Cr Palmer said the rally was a historic moment for the City of Bayswater.